Delhi Dynamos host the mighty Bengaluru FC led by Indian football legend Sunil Chhetri. But with their renewed vigour, the Lions are capable of causing an upset and beating the visitors. Will the Dynamos go beyond expectations or will the Southern giants maintain status quo? The Hero Indian Super League (ISL) is India’s unrivalled football championship which kicked off on 12 October, 2014. The league has ten franchises based in the following cities: Chennai, Delhi, Goa, Guwahati, Kochi, Kolkata, Mumbai, Pune, Bengaluru and Jamshedpur. Their aim is for India to become a global football power and qualify for the 2026 FIFA World Cup! 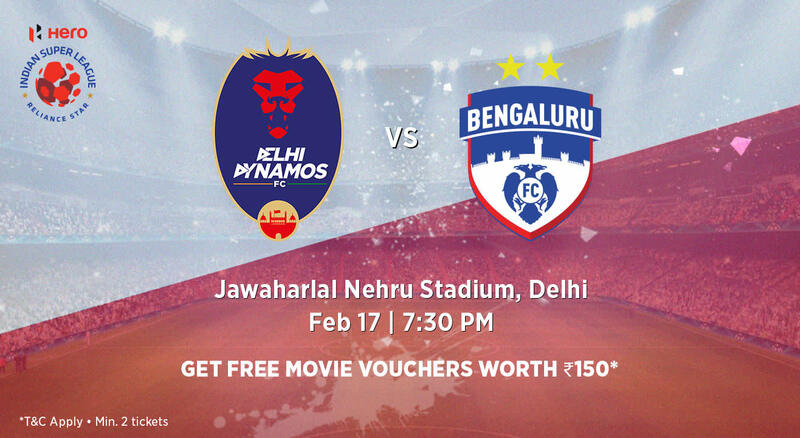 Get tickets to other Delhi Dynamos FC home games here. Delhi Dynamos is an engrossing and fascinating club. A roller coaster ride through the first 4 ISL seasons where they made the semi-finals twice, showed progress only to fail to build on it consistently. Their philosophy is sound though. Focus on young Indian talent and help them progress to the national side and develop them in the league along the way. An outspoken managing director, a raucous fan base and some interesting pre-season appointments including former Barcelona youth coach Josep Gombau as head coach this term make the club even more compelling to follow. They have identified the defensive areas that need to be strengthened after conceding the most goals last year by bringing in some steel in Bikramjit Singh and Narayan Das. After two years of progress, last season was a bit of a blow, and they will be even keener to bounce back and make their first final in this tournament! What a debut season Bengaluru FC enjoyed, coming within a whisker of lifting the coveted trophy in their first attempt! Led by the imperial Sunil Chhetri, who top scored with 14 goals, and boasting a beautiful combination of Indian and foreign talent, they topped the group stages table by a whopping 8 points. After the departure of Albert Roca, ex-assistant coach Carles Cuadrat will manage the side having tasted success with them in the past. Spanish winger Xisco, Bhutan sensation Chencho Gyeltshen and Rino Anto are among the astute signings the club have made ahead of the new season. An iconic fan base led by the West Block Blues, a club seeped in doing things the right way and a brand of vibrant, easy on the eye football, what else could one want! The new ISL season will be extremely competitive, but there is no reason why Bengaluru FC can’t repeat last season’s heroics, and maybe even go one step further.